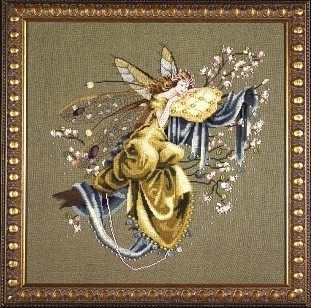 Stitched on 32 count Ivory Linen by Wichelt Imports. Stitched area is 10.69" by 13.56" with a stitch count of 171 x 217 Stitched 2 over 2. DMC floss used. Blends are one strand each. This piece combines the mesmerizing artistry of jewelry with the symbolism of a woman emerging, strong and resilient. She is floating with painted wings and a faceted crystal heart. 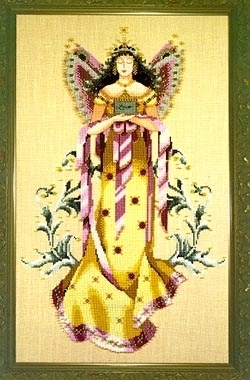 Stitched on 32 count Star Sapphire Linen by Wichelt Imports. Stitched area is 9.38" by 8.81" with a stitch count of 150 x 141 Stitched 2 over 2. Blends are one strand each. 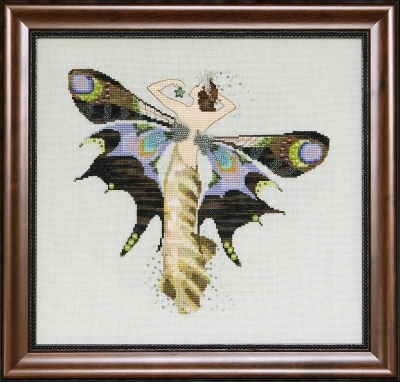 Reminiscent of luxurious Art Nouveau jewelry, a woman emerges with butterfly wings from a chrysallis with a twinkling crystal star and enameled wings. Stitched area is 9.06" by 8.63" with a stitch count of 145 x 138 Stitched 2 over 2. Blends are one strand each. 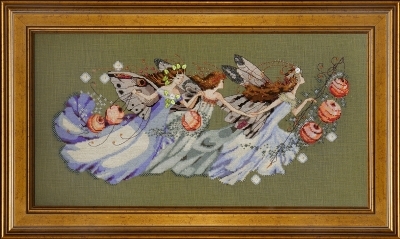 Shakespeare’s Fairies run through the twisted forest with only flirefly lanterns to guide them. Their gowns sparkle and flutter around them in the pale blue moonlight. They whisper and quietly giggle about the lovers’ follies on this midsummer night. Stitched area is 19.19" by 8.5" with a stitch count of 307 x 136. Stitched 2 over 2. DMC floss used. Blends are one strand each. Delicately perched on a curling ribbon of grass, she is caught in a serene moment of peaceful meditation. She dons a dress skirted with green and blue leaves. Her arms and legs are draped with beads. If she is disturbed her dew laced wings will scatter droplets and she will flutter away. You will wonder if you even saw her at all! 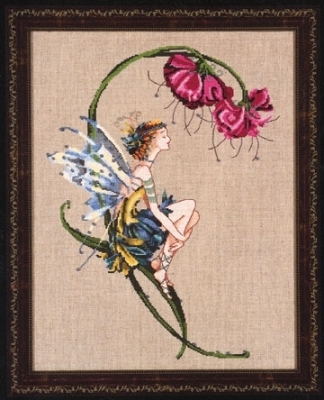 Stitched on 32 count Natural Linen by Wichelt Imports. Alternate fabric is Zwigart Belfast 32 count Raw Linen. Stitched area is 12 1/4" x 16 1/2" with a stitch count of 197 x 261. Stitched (2 over 2). Model stitched with DMC floss. Asterisk indicates number of packages used. 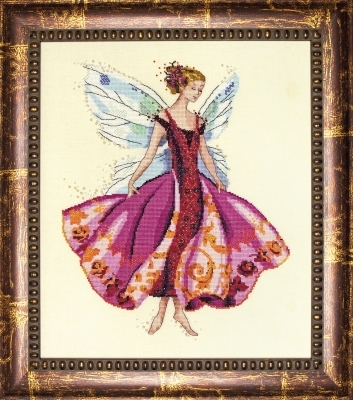 Please, use a blend of DMC floss numbers 746 and 950 for the uppercase A symbol at the base of the fairy's wings. We apologize for any troubles that this may have caused any of our stitchers. 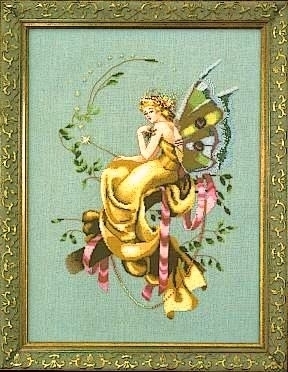 This fairy has grand, expressive wings in lovely shades of lemon yellow and sea foam green. She is light and fresh and glistens with beads. Pale roses and petals flutter to the ground from her fuchsia shaded frock. Stitched area is 13 1/4" x 17 3/4" with a stitch count of 211 x 282. Stitched (2 over 2). DMC floss used. Become lost in the splendors of blue and green with this prancing miniature fashion muse. 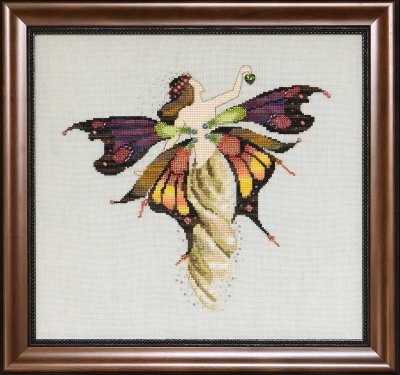 With delicate iridescent wings and velvety feathered skirt, she breaths new life into an age old craft. Cross-stitch and decorate the everyday with textures from nature mixing grace and color from head to toe. Stitched area is 12 ¼" x 15 ½" with a stitch count of 193 x 243. Stitched (2 over 2). DMC floss used. The symbol ">" (DMC 725) on the green feather on the left of her skirt should be "7" (DMC 907). We apologize for this error and hope you see it before you stitch it. Also, on some of the charts, a small area of stitches on the rightmost wing does not appear. Please use this file to complete the design if your pattern is missing this section. 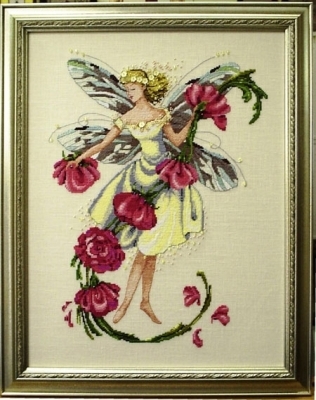 This fairy seamstress created her ensemble out of gathered bits and pieces from an English cottage garden. She stitched her frock with lilly petals that shimmer with vivid shades of deep fuchsia and mandarin orange. Complete with gauzy lavender wings and blossoms on her delicate slippers, she contemplates her next gown made entirely of blushing petals while gazing up at a fiery red poppy. Stitched area is 10 1/4" x 18" with a stitch count of 161 x 287. Stitched (2 over 2). DMC floss used. Blends are one strand each. 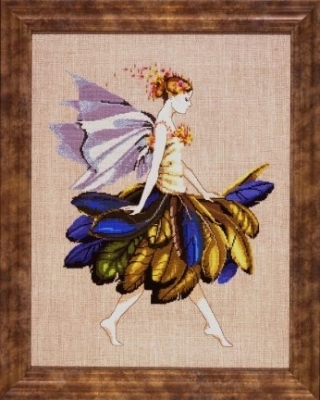 The asterisks in the Fairy's hair should be a solid star stitched using 869. We apologize for the error. Fast asleep after prancing and dancing throughout the night, this beautiful fairy certainly leads a charmed life. With dangling jewels, a glittering gown, and ethereal wings, we find her quietly nestled in a blooming tree. Usually planning parties with her fairy friends and crafting fanciful gifts for them out of blossoms and magic treasures, this is one of the few moments you will ever catch her motionless. Stitched on 32 count Laurel Linen Linen by Wichelt Imports. Alternate fabric is 32 count Belfast Olive Green Linen by Zweigart. 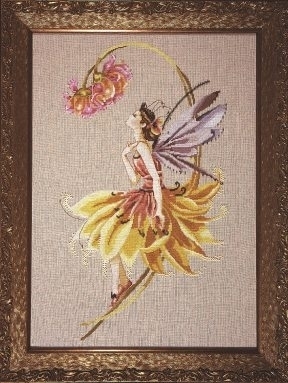 Stitched area is 13" x 14" with a stitch count of 207 x 222.